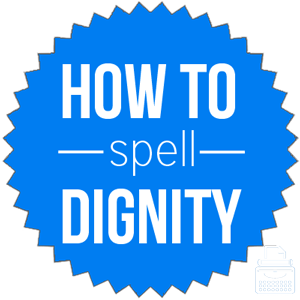 Spelling of Dignity: Dignity is spelled d-i-g-n-i-t-y. Definition of Dignity: Dignity is the quality or state of being worthy, honored, or esteemed. It also means a high office, rank, or position. And finally, dignity refers to formal reserve or seriousness of manner, appearance, or language. Pronunciation of Dignity: Dignity is pronounced dig-ni-tee. What does dignity mean? Dignity is a noun. It refers to a state of being worthy of respect or honor or to the way one carries himself with seriousness and self-control. Someone with dignity appears and behaves in such a way that is honored and admired. Dignity is an inherent state of nobility, worth, poise, and/or self-respect. The team acted with grace and dignity in their defeat. Their country cherishes human dignity and freedom. Dignity may also refer to the honor or respect associated with an important position or to the high office or rank itself. The congressman diminished the dignity of his position by accepting a bribe from a lobbyist. Due to his promiscuous actions, he was deposed of his dignity as Chief. Dignitary is related to the word dignity. A dignitary is a person of an exalted rank or high position, holding dignity or honor. The plural of dignitary is dignitaries. The mayor invited many foreign dignitaries to the dinner. The foreign dignitary tried to bribe the politician with $1 million. Beneath one’s dignity: fitting for someone considered less important. He thought cleaning the floors was beneath his dignity. Dignity was first used in the 13th century, according to Merriam-Webster’s. The word dignity comes from Middle English dignete, from the Anglo-French word dignete. Ultimately, the word is of Latin origin, from dignitat-, dignitas from dignus, meaning worthy. Dignity is a noun referring to a sort of stateliness or worthiness or to a high rank or office and the respect that comes with such a position.